Dr. Joseph Cannizzaro’s book is a trove of knowledge gained from practicing in his pediatric integrative medicine center for the past 20 years. Dr. Cannizzaro has been a pediatrician for over 40 years and found an unmistakable web of interrelationship among the 4-A disorders and the patterns behind them. In his book, he lays a foundation for understanding this epidemic, including . . .
A comprehensive overview of each of the disorders–their causes, characteristics and commonalities. A groundbreaking integrative treatment program that includes nutrition, supplementation, medication and detoxification. What has gone wrong? As even a casual reader or listener of the news knows, the statistics are alarming. Autism, ADHD, asthma, and allergies–all four of which happen to begin with the letter A–are on the rise, especially among children. In fact, it is not stretching the definition of the word epidemic to use that term for the way these disorders are sweeping the Western world. 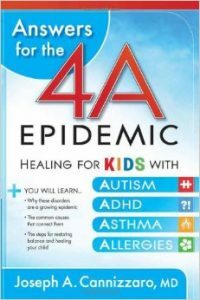 None of them are communicable in the classic understanding of the term, but all four sets of disorders, as you will see throughout this book, share common root causes that contribute to the development of current epidemic proportions. Autism, attention deficit disorder (with and without hyperactivity–ADD/ADHD), asthma, and allergies–these are the new childhood epidemics. A tragedy of this magnitude would be overwhelming except for a salient fact: these new epidemics can be defeated. After 20 years of treating patients, I have found that beneath the surface there is an unmistakable, unshakable web of interrelationship among the 4-A disorders, and I have learned to recognize the patterns. Toxicity in the brain and body causes metabolic dysfunction, which cascades with other factors to produce one or more of these disorders. Often they overlap with each other in the same person. By uncovering and treating the common causes of these 4-A disorders, we can embark on a common (and hope-filled) path to recovery.